This year, Real Men are looking to outfit 120 children with a bike, helmet, bell, and lock. We are excited to be doing this for students at Adelaide Hoodless, a school near our future Gage Park Campus. To donate a bike (in good condition or needing only minor repairs), please contact Real Men Hamilton to arrange pick up or drop off. On Sunday, October 16th, we held a REAL MEN Bikes N’ Burgers event. The ride, 60 kilometers in total, started at Chedoke Golf Course and was broken up mid-way by a barbecue at the Wood’s farm in Lynden. As we started out, there was some talk about the weather and how much rain we might encounter. It was overcast, but whatever was going to come our way, we were determined to reach the Woods’ farm and enjoy some burgers. Heading out along the trails towards Highway 52, we had a good number of guys stretching out and staying dry. A few sprinkles of rain was not going to dampen our day! New riders were enjoying the route, and returning riders knew they’d be hitting Powerline Road soon, where the views would open up and bike wheels would glide on the hard asphalt roads. Many riders opted for the shorter route this year, joining the ride at Highway 52, and a larger pack headed out from there towards the Wood’s farm. Still no sign of significant rain. Arriving at the farm, riders were greeted with refreshments and snacks. There was time to hang out and meet other guys who had driven out to the farm by car, and the chance to enjoy the food and entertainment. M.C. Matt Morrison was entertaining and got the crowd involved in riddle-solving games that had everyone talking and laughing as they enjoyed the burgers. Our chefs for the day did a fantastic job at providing food for all, and everyone ate their fill. Jeff Anderson shared what REAL MEN Hamilton is up to in the city and all about the bike drive in June, which provided bikes for 54 kids at Hess Street School. There will be opportunities to take part in a similar bike drive in Spring 2017 at Adelaide Hoodless, so if you would like to volunteer or donate, we would love to hear from you. To cap a great time at the farm, Eric Savard shared his story of how a marriage can be restored. He talked openly about how he turned from a life of self-gratification, alcohol and drugs, to one of commitment to his marriage and family. Giving all the credit to Jesus Christ, Eric articulated his struggles and victories. The winners of the door prizes, a feature of all REAL MEN events, were awarded gift cards for The Works to enjoy a burger on their own time (with or without their bike), and then the riders took off back to Hamilton. The ride home was a pleasure. The sun finally put its hat on, and we rode the 30km back to Hamilton in fine weather, feeling full and satisfied. Real Men’s next event is coming up on Thursday, October 27th 7:30PM at 1045 Garth St. Join us for this Guys Night Out and hear an inspiring message titled: Step Up! Serving to gain your wife’s trust. Join us in the cafe afterwards for an awesome special: The Whole Hog – a BBQ Pulled Pork Sandwich and drink for $5. If you’re not a rider, simply drive to and meet everyone at the farm for the BBQ at 3PM. All riders will begin the ride back at 4:30PM. Please register so we know how much food to prepare. Register by OCT 10 and get a discounted rate of $10 (paid in CASH at event). What a great way to head into summer—riding a bike! Last month, 54 students at Hess Street School, from Kindergarten to Grade 8, received a bike, helmet, bell and lock. They are now enjoying getting out and about, around Hamilton, on their new wheels. REAL MEN Hamilton partnered with the Yoe Men Club at Hess Street School to gift bikes to three students from each class throughout the school. The Yoe Men Club, a group of boys aged 10-14, led the initiative in the school, creating a reward tickets students could earn for good citizenship. Students responded by being a good friend, caring for others and their school environment and participating in a school playground clean-up to earn tickets towards a bike. Three students from each class earned a bike and Yoe Men’s leadership really made a difference in school. Out in the community, groups of men from REAL MEN Hamilton collected quality used bikes and made sure they were in great working condition to meet the students’ needs. People from Living Hope Church contributed donations towards helmets, bells and locks—and the Bike Drive was up and running! On June 9, the students came with their families to pick up their bikes. Canadian Helmet Initiative donated helmets and sent a team to fit the helmets for each student. This community support was most welcome, and it was also great to have the support of New Hope Bikes as a destination for students to visit for ongoing repairs in the future. As REAL MEN Hamilton volunteers arrived on June 9 with the bikes, families from Hess Street School arrived with excited children, ready to pick up their new wheels. Volunteers from Living Hope Church came out to set up face painting and soccer penalty shootout stations for students as they waited for helmet fittings. The carnival atmosphere added to a great community event. 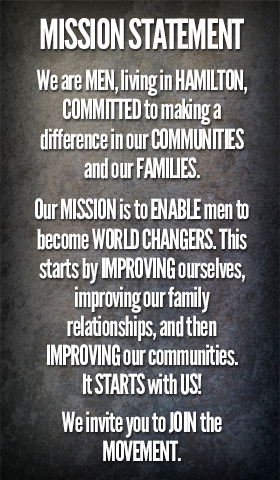 REAL MEN Hamilton is committed to making a difference in the lives of families and communities, and we recognize that it starts with us—all of us! We are thankful for the support of the staff at Hess Street School, the Yoe Men Club, Living Hope Church, Canadian Helmet Initiative and New Hope Bikes. We look forward to more opportunities to partner with the community to give back to the community. Join us for the ultimate burger showdown on SUN JUN 12 4PM-8PM at 620 Trinity Church RD, Hamilton. 8-10 teams will compete head to head for the title of Best Burger. Sample a piece of each available burger and then vote for your favourite. This event is open to Men ages 17 and up. REAL MEN Hamilton making a difference! This Spring, we’ll be partnering with a local Hamilton school in a Bike Drive, fixing up and giving bikes to kids. We’ll need bike donations, helmets, locks, and committed volunteers. Do you want to make a difference in your community? Join us and help out. To find out more, email us today.